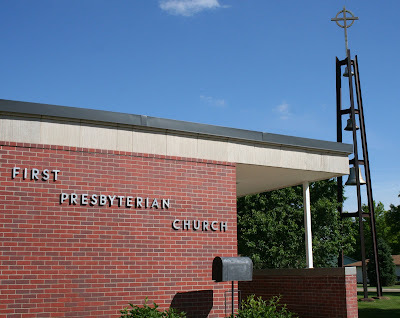 A group of Presbyterians formed a congregation in York in 1871 and built its first permanent church building the following year and later enlarged in 1880. In 1887 a more substantial brick structure was erected. 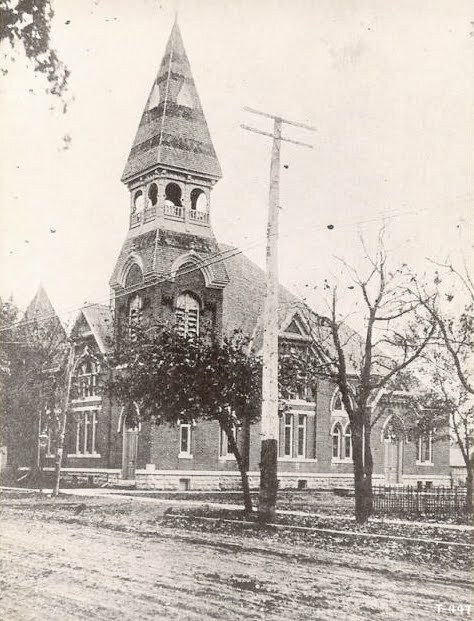 In 1949 a fund was established with the intentions of building a new church. The present structure was dedicated on December 3, 1967. The church is an utterly fantastic Mid-Century Modern structure; full of sweeping, horizontal curves and angles. Though the building was locked, I'm determined to see the interior of this striking church! A detailed history of this congregation may be found here. "This is the strong, ever-powerful, and living Christ whose sacrifice and resurrection liberated mankind," said artist Gary Coulter whose sculpture adorns the front of our church. The figure was placed on the building on June 13, 1969. It stands 9 feet tall, weighs 570 pounds, and is cast in bronze. Mr. 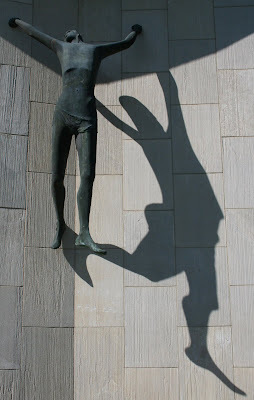 Counter, who was professor of art at Hastings College, interpreted his work by saying, "Although the sculpture is in the basic position of the crucifixion (the sacrifice that man should never forget), the main concept is that of the resurrection --the breaking away from the Cross—the living Christ." He portrayed this idea by eliminating the Cross, by throwing the head backward, and by arching the figure outward and away from the building. The fists are clenched in powerful strength, and the left leg is swinging free accentuating the breaking away from the cross. The whole movement of the sculpture is away and upward signifying the resurrection. He also stated that the most important single responsibility that the Church has is the liberation of people. He portrayed in this one piece of sculpture all of these ideas--the crucifixion, the resurrection, and the liberation of mankind. Yes! I would say so! Thank you so much for sharing this! Please email me at thesteeplechaseblog@gmail.com - I would be very interesting in comparing notes, swapping info, etc. Happy steeplechasing!